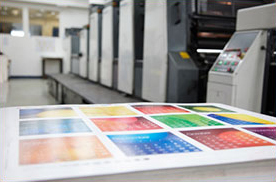 We start in the pre-press department where your files are thoroughly checked over to make sure that they contain adequate bleeds, crop marks and that all images are high resolution and set to CMYK. Next we will send you a pdf proof via email, dropbox or ftp depending on the size of the final file. The content you see in the pdf is what you will receive in your printed piece. Remember, this is not for colour but for content. 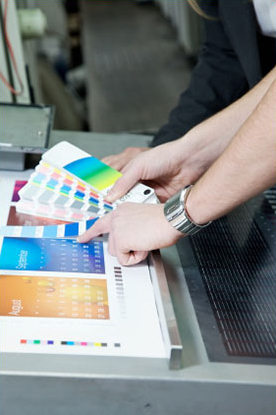 If you do want to get a more exact colour representation, we can also make a colour proof with our Epson Stylus Pro. Once we get the okay from you, your pdf is sent to our computer-to-plate system which provides you with better sharpness and detail than the old style film method. The greatest thing about our machine is that it's a Thermal CTP...i.e. a green machine! No chemicals are used when we make our plates and this translates to the emission of ZERO VOC's! After the plates are made, they are loaded onto the press. Our experienced press operator makes sure that the job is registered and the colour is set by standard industry densities (and also by common sense). Once the printed piece is acceptable to the operator, about 50 sheets are run and then the machine is stopped. This is when a second member of production also gives the job a thorough look over. If everything checks out again and is acceptable to both parties, the sheet is date stamped and the CMYK density values are noted on that sheet. The counter is set to zero and your job is ready to run! Upon completion of your print job, a profile is saved and when it is time for a reprint, we use the same brand of stock, same brand of ink and the saved profile. This ensures your printed piece and corporate colours will look consistent from batch to batch, and this is how we stay one step ahead of the game to earn your repeat business.